"Near the end of the session, Tyson was asked if he planned to do anything differently, if he captured the coveted mantle for a third time. "If I win the title, I might tattoo my face," he said. I think he was joking, but I'm not sure." 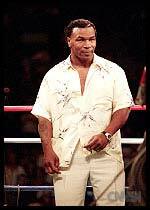 It turns out that Tyson wasn't joking at all. 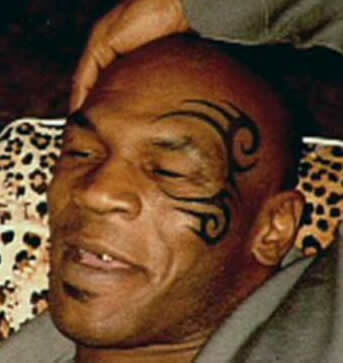 Mike Tyson's Facial Tattoo -- A Maori Inspiration? 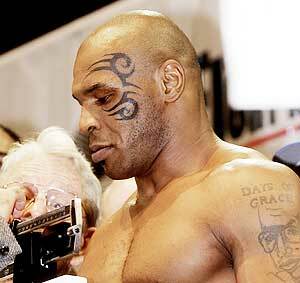 It's been widely reported in the media that Mike Tyson's recent facial tattoo is an "African Tribal Tattoo". 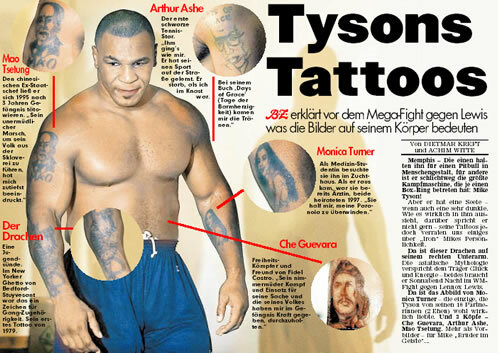 Tyson's tattoo is in no way, shape or form an "African Tribal Tattoo". It's a straightforward bold graphic design tattoo done in black ink that is widely known within the tattooing community as belonging to the "tribal tattoo genre", which is a heavily modified western tattoo style derived from the traditional tattooing normally associated with the peoples of Borneo, Polynesian and Micronesia. Tyson's tattoo is an excellent example of the style of "tribal tattooing" that was revolutionized in it's interpretation by tattoo artists like Leo Zuleta, and others, starting some two decades ago. Tyson's tattoo is not even remotely similar to the traditional tattoos of African tribal peoples and has no specific meaning whatsoever beyond it's meaning to Tyson himself. Indeed Mike Tyson's new "tribal tattoo" appears to be influenced by the bold lines of the tattoos of the ethnic people of Borneo and by a very common design motif prominent in the tattooing or "moko" of the Maori people of New Zealand. Within Tyson's facial tattoo it is possible to discern two spiral patterns very similar to the fern frond, or koru, that is a repeating motif common to Maori art, including tattooing or "moko", painting and carving, in both wood, bone and greenstone. A traditional Maori tattoo artist -- the tohunga ta moko -- could produce two different types of pattern: that based on a pigmented line, and another, the puhoro, based on darkening the background and leaving the pattern unpigmented as clear skin. Tyson's facial "tribal tattoo" generally follows the Maori rules laid out for facial "moko" or tattoos. Tyson's tattoo follows the contours of his face, enhancing the contours of his face and tracing the natural "geography", for example lines along the brow ridge; the major design motifs are symetrically placed within opposed design fields: lines are used in certain areas where spirals are not used; two types of spiral are used -- the koru, which is not rolled up and has a "clubbed" end, and the rolled spiral. (Ta Moko: The Art of Maori Tattoo, By D.R.Simmons) Tyson's tattoo appears to be based around a pair of puhoro koru. Tyson's tattoo itself appears to be well designed and executed. It's an excellent example of a modern tattoo influenced by the designs of traditional tribal tattooing. In fact, as tattoos go, and regardless of how you feel about them, it's a great tattoo! 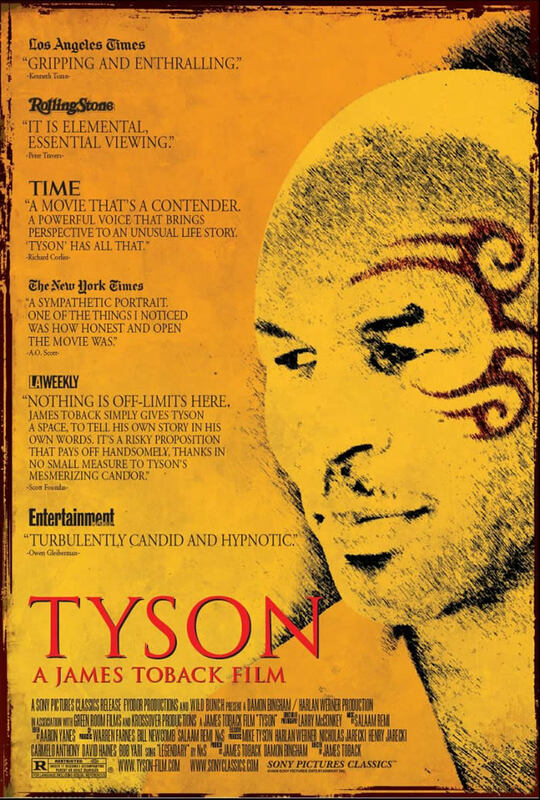 Despite the great acceptance that tattoos have recently enjoyed within mainstream popular culture, it's interesting to see the great furor that Tyson created in the media by getting a facial tattoo. Within mainstream pop culture it turns out, there are still a few tattoo stigmas left to be broken. 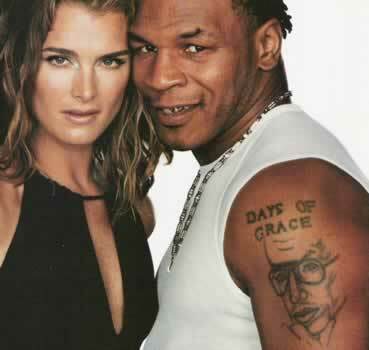 Mike Tyson has pushed the celebrity tattoo envelope in a completely new direction. PATRICIA STEUR TRIBAL PHOTOS GALLERY - photos of Maori tattoos. 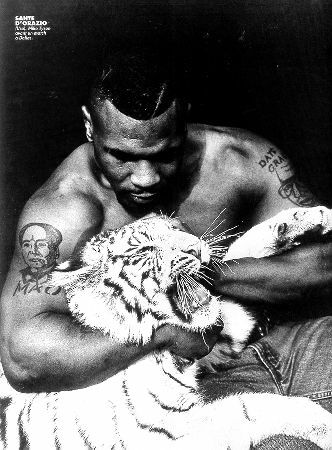 Among the many celebrities who are prominently tattooed, Mike Tyson's tattoos are particularly interesting. He has been very articulate about the symbolism and what he proclaims are the profoundly personal nature of his tattoos, featuring among others Arthur Ashe, Che Guevera and Mao Zedong. 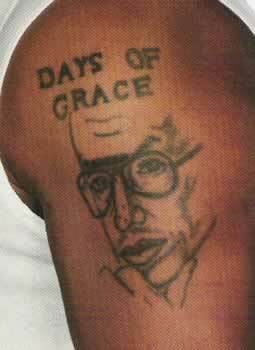 Tyson has stated that his tattoos are powerful personal totems. 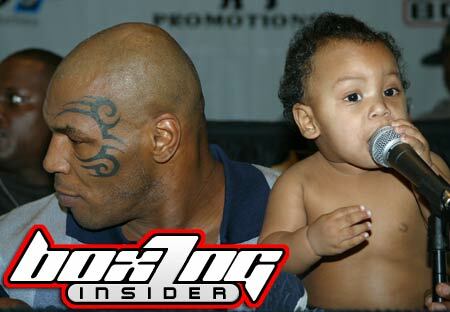 Tyson's most recent facial tattoo may be an extraordinary attempt to perform a very public ritual act. Almost all tattoos in traditional tribal cultures are performed as part of a larger elaborate rite of passage between adolescence and adulthood. Tyson may be trying to pull on his "warrior's" face by getting tattooed in such a visible way. Tyson had previously talked about getting a facial tattoo if he won his title fight with Lewis. This is something he has been thinking about a long time. I don't think it was an impulse at all. 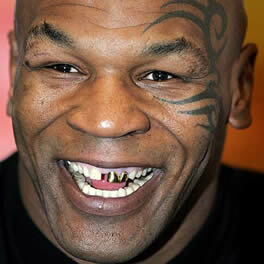 I think Mike Tyson's facial tattoo was an attempt for him to say, "This is what I'm all about. I am a man's man. I am a fighter and a warrior".